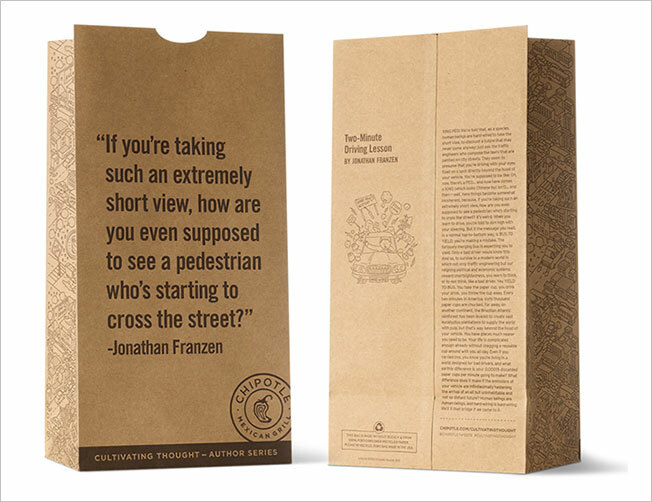 A new installment in Chipotle's "Cultivating Thought" campaign—which prints original short stories from successful writers on the sides of its paper bags and cups—has more high culture to go with your salty burrito and soft drink. This time, Chipotle wants talented souls to review those ditties with a degree of pith equivalent to less than two-thirds of a tweet: 103 characters, to be exact. (Not unlike that time it asked people to write haiku.) In exchange, it's giving away three year-long free-burrito passes and 500 free Kindle Paperwhite readers. Earlier iterations in the unlikely fast-food-publishing mashup included Toni Morrison, Judd Apatow, Michael Lewis and Jonathan Safran Foer, who conceived and curates the project. Now they're joined by Jonathan Franzen, M.T. Anderson, Anthony Doerr, Stephen J. Dubner, Laura Esquivel, Lauren Hillenbrand, Sue Monk Kidd, Lois Lowry, Tom Perotta, Mary Roach and Colson Whitehead. Some are charming bits of rumination, perfect for the medium. Doerr, for example, toys with familiar themes like the vastness of geological history and the insignificance of humans, but includes the right kind of empathetic twist: "Pascal said, 'When I consider the short duration of my life, swallowed up in the eternity before and after… I am frightened.' People say, 'Who wants to feel so small? Let me eat my burrito.' "
Best-selling novelist and internet punching bag Franzen, on the other hand, tediously complains that road signs are confusing (they're not), people are in too much of a hurry (they are, welcome to the rat race), trees are dying to make paper cups (true), nobody cares (they don't, see exhibit B, rat race) … but aw shucks, that's just the way things are. Franzen's observations obviously aspire to be mildly subversive—they're printed on paper bags and cups, after all—and insightful in a conveniently disposable way. But they also manage to be overseasoned and yet somehow still bland, much like a Chipotle burrito with everything on it. 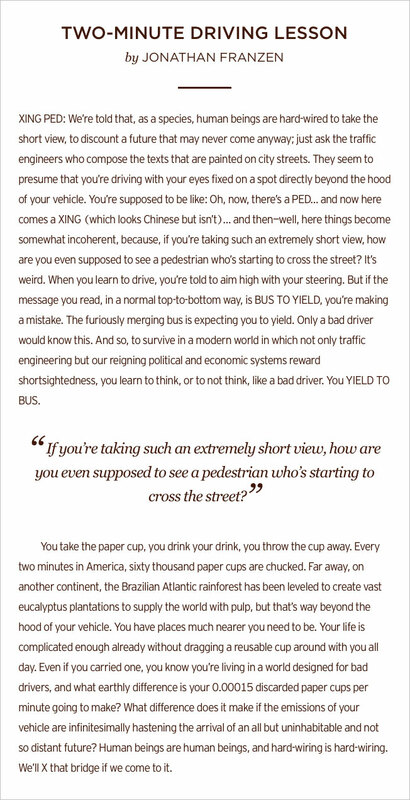 Jonathan Franzen hates road signs. Likes trees and burritos. Not sure about humans. Now give me free burritos. Or don't. The full text of Franzen's paper bag missive appears below.